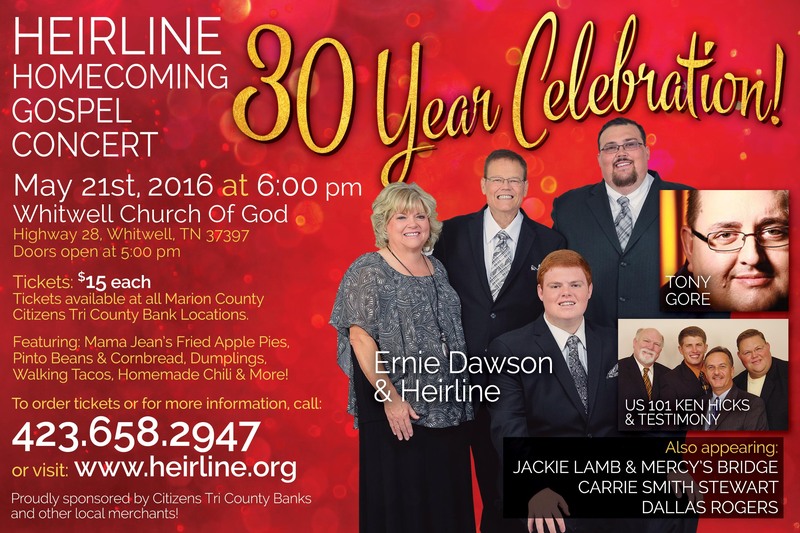 Heirline Annual Homecoming | Crystal Inc.
Posted on May 18, 2016 by Crystal Inc.
Our friends, Ernie Dawson and Heirline, are having their annual Homecoming Celebration this weekend! The singing will take place this Saturday, May 21st, at 6:00 pm at the Whitwell Church Of God in Whitwell, Tennessee! If you want to hear some great singing and fellowship with some wonderful people, make plans to attend! Also appearing with Heirline will be Tony Gore, Ken Hicks and Testimony, Jackie Lamb & Mercy’s Bridge, Carrie Smith Stewart and Dallas Rogers. This is one singing that you won’t want to miss! For more information, call 423-658-2947 or visit Heirline’s website at: www.heirline.org .